What’s a good family computer? Finding a computer that fits everyone’s need is a challenge. There are so many brands and variations. Asking a salesman will further confuse you. When people ask me this, I was always have a few questions for them to gauge what is right for them. So what makes this a good all in one computer for the family? Form factor and design. It looks good in the common areas of the house. It’s simple to setup, no messy cables everywhere. It’s fast and good for kids and adults. It has everything you need in a computer. Wifi, DVD, webcam, simple to use. Most computing duties in a household include Internet, email, social websites, youtube, pictures, video, and etc. 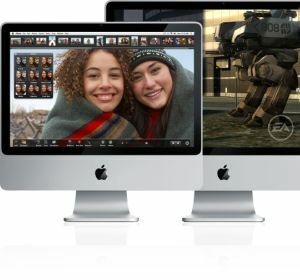 The Apple iMac does all that and more. Amazon has the Apple iMac 2.4 GHz with the 20 inch display for $1,159.99 with free shipping. Apple.com has the same computer for $1200. Next Post: Apple iMac DIY Ram upgrade. Save yourself a few bucks. This entry was posted in Desktop and tagged Apple, iMac on January 27, 2009 by admin.